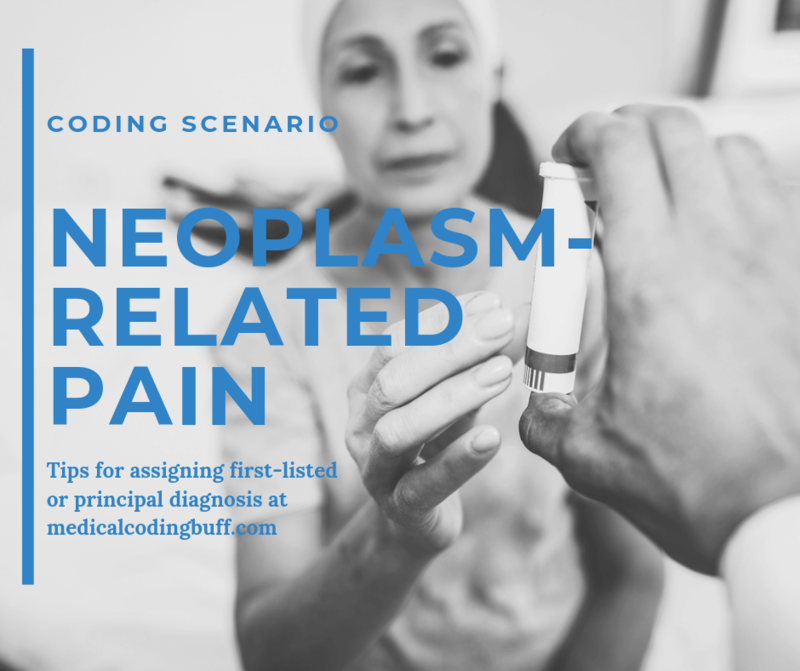 Coding and sequencing of neoplasm-related pain is based on the medical documentation and the ICD-10-CM coding guidelines. Question: A 58-year-old female patient presents with malignant neoplasm of the left breast with metastasis to the liver. She is seen to control the severe pain of the liver metastasis. Assign the first-listed or principal diagnosis code. G89.3, Neoplasm related pain (acute) (chronic).Documentation indicates that the pain is related to the neoplasm, and the reason for the encounter is for pain management. The guidelines also indicate that G89.3 should be assigned as the principal or first-listed code when the reason for the encounter is for pain management. In the ICD-10-CM Alphabetic Index, see Pain, due to malignancy (primary) (secondary) G89.3. Verified in the Tabular, G89.3 refers to Neoplasm related pain (acute) (chronic). Although we are not asked to code for the secondary diagnosis in this coding exercise, guidelines indicate the underlying neoplasms should also be coded after G89.3. In the ICD-10-CM Table of Neoplasms, see Breast, malignant primary C50.9-. Verified in the Tabular, C50.912 refers to Malignant neoplasm of unspecified site of left female breast. In the ICD-10-CM Table of Neoplasms, see Liver, malignant secondary C78.7. Verified in the Tabular, C78.7 refers to Secondary malignant neoplasm of liver and intrahepatic bile duct.